Please like and comment with feedback! Hey guys tape here and I have some very unforuante news for you guys. The tape vs juicebox season finale was not able to be uplaoded to youtube. Afer recording the clips (with camstudio) they were fine on my editer ( which also unfortunatly right now is movie maker) but when i uplaod the video to youtube there all black so nobody can see OR hear anything :(. It took a really long time now record and make so I am to lazy to record EVERYTHING AGAIN plus there were scenes which would be challenging to record again so I dont think it can ever get on youtube :(. If anybody knows ANY other site where the video could get uploaded to PLEASE let me know right away cause maybe it will work? I dont know but I feel really bad it cant get uploaded so sorry guys I dont know what to do. In other news I was REALLY busy this week whichi is why I could not post the updates. What basically happened is a new quest you can start at the TCA place at the beach and some new concerts coming up. You can also now get mod autographs ( by completing the quest) you can loook at them in your cazbook. And thats about it. Tell me what you guys think of it and any ideas you have for next season! Check it out and watch the FULL video to see who the contest and who gets to be in the season finale which is next episode!!! Hope you guys enjoy!! 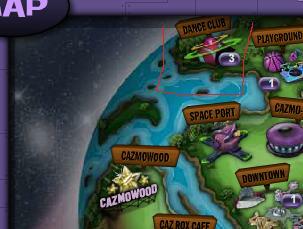 Hey guys tape here and today when I went on cazmo I noticed a new spot on the map. Its called the just jared dance club. This is for the 4th of July weekend coming up so happy 4th of July to everybody living in america. But for the 2nd year in a row cazmo has done NOTHHING for canada day which is on july 1st. I live in canada and find this not fair to all canadiens or anybody living outside america who celebrates a holiday around this time. Nothing agaist 4th of july cuz it really is a great holiday but come on cazmo. You can do better.